Bougainville: High up in the hills of Kongara, overlooking Kieta and Arawa is an amazing idea, just waiting for the intrepid traveler too stumble upon. 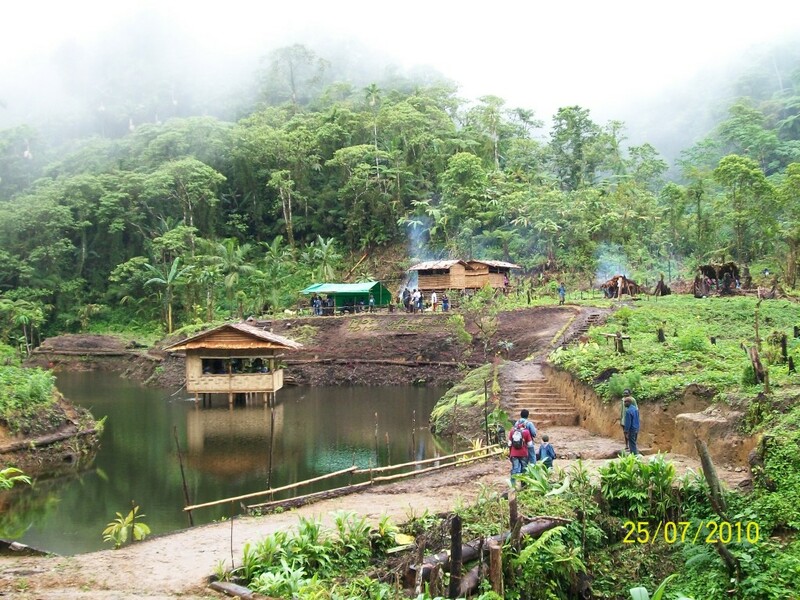 The Manee Resource Center is a brilliant project in the middle of the Kongara mountain forests being built for the preservation of certain old traditional knowledge of people in this area. It is entirely self funded. Two brothers David Onari and Leo Orino, felt that the young people and the generations after them would forget their culture and the importance of the forests and jungles, so they have been building this place to preserve what could easily be lost. Their work began in 2007 and their father, Thomas Orino has also become involved, using his knowledge and memories and that of the older generation to construct the special traditional houses that you will see there. I was invited by the local Elders (Council of Chiefs) to write about the center. So on the last Sunday of November this year, I sat at the back of 4×4 open back PMV as we headed out of Arawa, past Kieta, taking a right turn before the Aropo airport and headed up into the mighty hills of Kongara. It’s a beautiful drive. A bit rocky and uncomfortable in places but you are over-compensated with the scenery. Cold mountain streams,clear and fresh dash over rock beds awash with the colors of flowers. Birds sun themselves on rocks in the clearings. Lush green jungle, rich dark soil, and orange clay line the way. Panoramic views of the Arawa and Kieta bay suddenly appear out of the trees as you wind your way up the mountain side. (Sadly my trusty cheap digital camera had died by this time). Forty minutes later, we reached our destination. The Manee Resource Center is a clearing in the forest with a house on a shimmering large pond that looks like a miniature winding river-lake. I could see two traditional houses further up the hillside, flower gardens and ferns, running water, kids swimming in the pond with large fish swimming around them, and birds fluttering about, two young boys paddling a bamboo raft on their own little journey, the whole area surrounded by a misty jungle. The amazing thing is that this project is totally self funded by one brother and physically created by the other. David, who has a small operation selling and renting CD’s & DVDs in Arawa, funded the construction of the center, providing fuel and meeting other costs. His brother Leo, did most of the physical work. Beginning in 2007, they cleared some of the forest, blocked of an existing stream to form a pond in the gully and cleared the sites needed for the orchards, ferns and traditional buildings and traditional medicines. They didn’t clear more than they needed for their purpose. Their father, with his traditional knowledge has taken over building the traditional houses on display. The following is a description of everything there, beginning with the pond. The fish pond is known as a ‘Tavinara.’ These ponds existed in traditional Bougainville societies. The Tavinara is well stocked with healthy and very large fish. The kids love swimming with them. The house built on the pond is known a ‘Waunava,’ a shelter to rest in. Basically it is a rest house over the water. This house is built with a combination of old and modern material. It has thatched walls with sawn and nailed wooden floors. The Waunava is for the guests to relax in. Up on the hillside are the two interesting traditional houses. These are examples of houses that were built in the past as part of the initiation/rite of passage for the ‘Chief Meri’ (Female Chief) of Bougainville villages. Bougainville is mainly a matrilineal society where women are chiefs. It’s the first daughter of the chief who is next in line. In the past, several special traditional houses like these were built for the young girl as she made the passage to woman hood and assumed the role as the chief. The first house on the hills side at Manee is a ‘Kongonava’ (correct me if I spelt this wrong). This house represents the first stage of the young girl’s passage. She stays here, growing up, learning and being a child, before her first menstruation. After her first menstruation, she is moved to the second house, which is the second stage of her passage. This house is the ‘Dorinava’. At this house, she will be constantly surrounded by older women. She will be kept hidden as much as possible. If she leaves the house she will be shaded with ferns. She will be fed good traditional foods such as ‘Tamatama’ and her skin will be oiled. Here, she will also learn the traditions and responsibilities of being chief. When the time is right, a great feast will be prepared and she will leave this house for another house which has a kitchen. This shows that she is ready to be married. She is already traditionally engaged at this point. At Manee this house for the third stage was not yet constructed. The houses for the ‘Chief Meri’ are built in a unique style. The houses are built around 2 meters of the ground and accessible by a wooden ladder. They use jungle ropes and stripped bark to lash the supports and frames together. The roof and walls are thatched sago while the floor is made out of ‘limbum’ from palms (I have no idea what the English word is for limbum). The raised supports of these houses consist of intricate series of logs lashed together. You have to see the pictures to understand what I mean. This design not only looks great, but also keeps anyone from sitting under the houses. They were in the process of building the other traditional ‘Chief Meri’ houses and more when I was there. At Manee they have also planted traditional medicinal herbs, orchards, ferns and other plants both in the cleared places as well as in the forests around the center. Many of the school children from Arawa and their teachers visit the center. The kids have a great time as well as learn new things. They plan to build a small guest house here to accommodate visitors who want to spend more than a day up in the cool climate. It is their hope that the Government can provide tourism assistance, such as training or funding, to assist them to achieve the vision of an eco-friendly, cultural center that preserves and passes on traditional knowledge to both locals and visitors. David (closest to camera) & Leo. The brothers who started this project. This girl enjoys the cool waters of the Tavinara, the pond. Chief Meri Houses. Closest to the camera is the Kongonava. The next is the Dorinava. The Waunava entrance. Rest house on the water. The Waunava. Rest House on the water. Kongara Flowers. You must go. It is awesome!!! from Arawa and K5 per head (at the time of this writing). I suggest if you don’t know anyone to assist you to go see it, get in touch with Zhon Bosco of Bougainville Experience Tours on email bogexperience_tours@hotmail.com website www.bougtours.com to assist you. For more information on Papua New Guinea and getting to Bougainville visit www.pngtourism.org.pg.